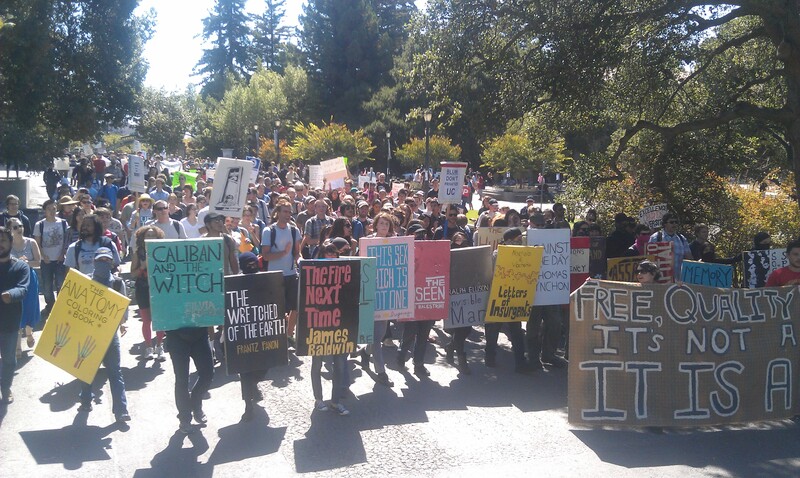 BERKELEY, CA – Between 100 and 200 students marched from a rally at noon in front of Sproul Hall, and entered Tolman hall against austerity measures cutting public education through out the state of California. Demonstrators entered the lobby of the building only to be met police batons and pepper spray. Police claim that pepper spray was used in response to someone grabbing a magazine clip from one of the officers, but at least one witness says that these were two separate events, and that the magazine clip was only found later after a police officer dropped it. [The police] never rallied, somehow, and despite two helicopters circling and enforcement arriving constantly, they had so clearly got their asses kicked that their sticking around just humiliated them further. From the beginning, we treated them so aggressively, and once the blond cop dropped her clip and had to scramble around for it in the doorway, they never recovered. Students were able to take a hold of room 2308 and other parts of the first floor through the afternoon and into the evening until the police evicted them from the building. Tolman hall is the education and psychology building, closed to general classes for retrofitting. The occupiers released a statement in full below. The arrested students are seeking financial support to help cover the cost of posting bail, please read more if you can donate some money! Police officer chokes student demonstrator in front of Tolman. -Around 1pm, Police began physically throwing students out of the building. -Around 50 students occupying Tolman. 4:30pm – holding a meeting. 8:00pm – One student arrested in the hallway of Tolman while talking to the police! The details are unclear, but the one student arrested was standing outside of the meeting and was approached by police. Folks in the meeting heard screams for help, only to see him being tackled to the floor. Police claim this student had assaulted an officer earlier that day. 9:08pm – 2nd Arrest after being put in a headlock, blood on floor! Police have warned protesters to leave (without giving a formal dispersal order), but POLICE ARE BLOCKING EXITS! 9:17pm – Occupiers are leaving the building. 9:30pm – As the group of protesters leave campus, a bus full of police arrive and begin following the protesters. 9:45pm – Protesters announce to return to Tolman at 10am tomorrow (Friday). We’ve come together today to call for a halt to the destruction of our public schools, and to insist that education be universally accessible and free. But today we are not simply pressing demands; we’re also working collectively to reclaim our campus, to make it a little more public and a little less estranged from us. Starting this afternoon, we’re opening up a university building to be used as an organizing and educational space; for teach-ins, film screenings, planning meetings, and whatever else we students, workers, and debtors at large decide will help us more effectively resist austerity. We’ve decided to begin by reclaiming the seismically-unsafe Tolman Hall. In August 2011, The Daily Cal reported that in the midst of the “financial crisis”, unsafe buildings across the 10 UC-campuses would have to wait before they could be retrofitted. The administration has shut down 13 classrooms in Tolman Hall, which we are here to reclaim and transform. The UC administration has engaged in an actuarial risk assessment and decided that students should not be in the building but that workers are still required to labor there daily. While buildings like Tolman Hall are being closed throughout the UC-campuses, the University continues to build multimillion dollar buildings that are nominally public. Tolman Hall stands as a ruin of public education. We want to call attention to the ways in which the dismantling of public education and public services is manifested by the defunding of public infrastructures on our campuses and in all classrooms across this country – buildings and classrooms that are not simply “brick and mortar” but are the spaces of collective action and institutional memory. Today, we move to remake these landscapes of inequality and to open up a new center of resistance. This entry was posted on 22 September 2011 at 12:43 pm and is filed under News, UC Berkeley. You can follow any responses to this entry through the RSS 2.0 feed. You can leave a response, or trackback from your own site.